Exquisite revival of Anita Loos’ play version of the Colette novella has an enchanting Connie Castanzo in the title role. Before Lerner and Loewe’s musical version of Colette’s turn-of-the-last-century novella, Gigi, returns to the New York stage, get to The Storm Theatre and see an exquisite revival of Anita Loos’ non-musical stage adaptation of the story which preceded the MGM movie by seven years and launched the career of Audrey Hepburn in the title role. Artistic director Peter Dobbins has staged a chic and polished production which couldn’t be more French unless it had used all Gallic actors, and has found a charming Gigi in Connie Castanzo. The production is redolent of the heady atmosphere of fin-de-siècle Paris and the women’s gowns designed by Courtney Irizarry are a veritable fashion parade of loveliness and style. The stage adaptation of Gigi is extremely faithful to the novella keeping the settings to the Parisian homes of Gigi’s grandmother’s Mme. Alvarez with whom she lives and her Aunt Alicia who she visits for lessons, unlike the more well-known MGM film musical which opened up the story to include famous locales in Paris as well as a trip to the seaside. Sixteen-year-old Gigi has been brought up in the home of her grandmother, formerly a well-known courtesan, and her mother, a minor singer at the opera, with the expectations that she will follow her grandmother and her Great Aunt Alicia, a legendary cocotte in her day, into becoming a courtesan with a great future. In the meantime, Gigi, though still a precocious schoolgirl, is given training in social manners, fashion and etiquette, which she doesn’t take seriously. A regular guest in the house is her grandmother’s friend Gaston Lachaille, the young millionaire bon vivant, who calls Mme. Alvarez by the affectionate name “Mamita.” His visits include bringing Gigi her favorite licorice and playing cards with her while he lets her cheat, as well as to drink chamomile tea and confide in Mme. Alvarez. All the while, she watches over the growing friendship between her granddaughter and the young man. However, Gigi is growing up, and when Gaston breaks off with his current mistress, Liane d’Excelmans, the older women see their chance and try to arrange a liaison between Gaston and Gigi. They dress her up as the young woman she has become and parade her before Gaston. However, Gigi has other ideas: having heard the endless gossip all these years about the ups and downs of such a life, she will have none of it. Remarkably, she turns out to be the shrewdest one of all. Castanzo’s Gigi beautifully captures the young schoolgirl who does not yet know she is beautiful or the effect she has on men, as well as the young woman she turns into in the course of the play when she puts up her hair and appears in a more grownup outfit. Both Kathleen Huber and Evangelia Kingsley capture the European manner, not often portrayed on our stages, with grace and style, as her older relatives. The wonderful Huber who always seems to mean more than she says as the worldly-wise grandmother also embodies the Spanish aura that Mme. Alvarez has adopted when her married lover died, swathed in black lace and heavily made up. The elegant Kingsley’s Great Aunt Alicia, on the other hand, is hauteur and vagueness personified dressed in sumptuous outfits that befit one who has previously consorted with kings and princes. Justin Adams is a very smart and debonair Gaston, sophisticated and urbane in his dealings with all of the ladies. In the hands of Kate Chamuris, Gigi’s mother Andree is amusing in both her drunken scenes as well as her unfortunate attempts at grand opera. Jamil Chokachi as Alicia’s butler reflects the same superiority and snobbishness as his mistress, while Cheri Paige Fogelman as Mme. Alvarez’s impressionable maid embodies the not so coy manner of one who is under the spell of the famous Gaston. Dobbins’ elegant staging makes use of the clever setting by Brain Dudkiewicz which uses the same set for both the homes of Mme. Alvarez and Great Aunt Alicia, but which puts the entrances to each at opposite ends of the playing area. Irizarry has created a veritable fashion parade for the 1900 women’s gowns, an era of great style and panache. Unaccountably, the rich Gaston appears to wear the same outfit in all of his visits. Sound designer Joel Abbott makes wonderful use of Offenbach melodies to set the time and period. Michael Abrams’ lighting design creates a warm, intimate environment for the two settings of Colette and Loos’ story. Not only does Anita Loos’ adaptation of Gigi not make us miss the famous Lerner and Loewe songs, its intimacy and sophistication make it a fine play in its own right. This first major New York revival staged by Peter Dobbins captures the perfect graceful style needed and keeps us entertained at all times. 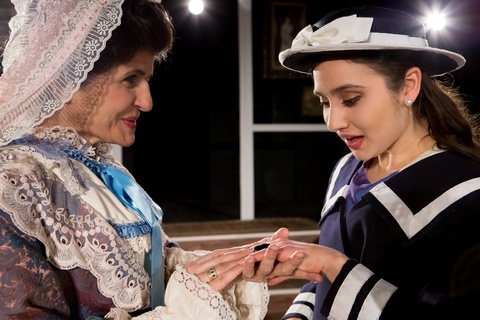 Under his astute direction, Connie Castanzo in the title role and Kathleen Huber and Evangelia Kingsley as her sophisticated relatives give memorably evocative performances. Classic 1911 Yiddish play by David Pinski has been given a first English translation and been reset in the 1950’s with David Greenspan in the title role. A taut and funny revival of a gem of a play by Yasmina Reza.